A. When Samuel was old. B. In nations, families usually like to keep their power structure in place by appointing the next generation to rule after them. 1. There is a legacy. C. NOTE: They were not judges in the sense of being deliverers like their father and the 14 who preceded him. They were officers of the court. They would hear and rule over matters pertaining to the law. 1. Joel was the firstborn. 3. He was the father of Heman the singer. 1. The second born son of Samuel. …they were judges in Beer-sheba. A. Beer-sheba was the southern most city in Israel. B. It was located in the territory of Judah. C. It may have been recovered from the Philistines after the victory over them (See I Sam. 7:10, 14). B. This seems to be a common occurrence. The parents are faithful, but the children stray. It happens often to church leaders. …but turned aside after lucre, and took bribes, and perverted judgment. 2. We saw in chapter 2 how Eli’s son’s would take things from the people by force for their benefit (I Sam. 2:16). And all the elders of Israel gathered themselves together, and came to Samuel in Ramah. A. The first reference to elders as leaders is found in Genesis 50:7. B. The first reference to the elders of Israel is in Exodus 3:16. 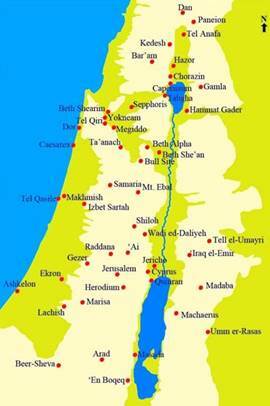 C. By Exodus 24, a team of 70 elders had been selected as the governing body of Israel under the leadership of Moses. In Numbers 11 we read of God’s specific call for this body of leaders to serve with Moses in the wilderness: “Bring me seventy of Israel's elders who are known to you as leaders and officials among the people. Have them come to the tent of meeting, that they may stand there with you” (verse 16) (https://www.gotquestions.org/Old-Testament-elders.html). 1. Older and experienced men. 2. Men who were over their family, their clan, and were highly ranked in their tribes. 3. They were part of the judicial system in their communities. 4. We often hear of the elders who were by the gate (Deut. 21:29; Prov. 31:23). It was there that the elders rendered judgment about various cases that were brought to them (See Ruth 4:1). A. They desired to have a king to rule over them. B. At this time, the nation of Israel was a theocracy. They were under the rule of a heavenly King, God himself. This is what they wished to thrust aside for a human king. C. God had foreseen this day long before it happened (Deut. 17:14). When thou art come into the land which the Lord thy God giveth thee, and shalt possess it, and shalt dwell therein, and shalt say, I will set a king over me, like as all the nations that are about me. C. They wanted to be like the nations around them. 1. LESSON: This seems to be a problem for God’s people throughout the ages. But the thing displeased Samuel, when they said, give us a king to judge us. C. There were several factors involved in Samuel’s displeasure. 2. It was a change requested without the authorization of God. And Samuel prayed unto the Lord. A. Samuel prayed. It would be interesting to know the content of Samuel’s prayer. B. This is what all of us need to do when troubling times come our way. …for they have not rejected thee, but they have rejected me, that I should not reign over them. A. God said they have rejected Him. B. God reminds Samuel that it was not he who was being rejected. Instead, the people were rejecting God. C. There has been debate as to the actual sin involved in this request. 1. God knew and foretold of the time when a king would reign over Israel. 2. The time of the judges was difficult. Perhaps God would have appointed a king had the nation approached God about the matter, but they did not. 3. Thus, it was more of a heart problem for the people. They did not care about what God had to say with regard to this matter. Calvin: “They might, indeed, have reminded Samuel of his old age, which rendered him less able to attend to the duties of his office, and also of the avarice of his sons and the corruptness of the judges; or they might have complained that his sons did not walk in his footsteps, and have asked that God would choose suitable men to govern them, and thus have left the whole thing to His will. And if they had done this, there can be no doubt that they would have received a gracious and suitable answer. But they did not think of calling upon God; they demanded that a king should be given them, and brought forward the customs and institutions of other nations” (Keil & Delitzsch, e-sword). A. Since the day that the Lord brought them out of Egypt. B. Israel always had a difficult time honoring God and walking in His ways. 1. Their rebellion began at Mount Sinai when they built the golden calf (Exo. 32:1-4). 2. During the period of the judges, their idolatrous ways persisted. 3. Even when Samuel became a judge, he had to cleanse the nation of idolatry (I Sam. 7:3-4). 17. “Now therefore hearken unto their voice: howbeit protest solemnly unto them” (I Sam. 8:9). A. Why would God allow the Israelites a request which a clear rejection of His rule? 1. Could God’s plans have included a king? It was supposed to be a king of His choosing. 2. God sometimes grants man his selfish requests in order to teach him a lesson. …and show them the manner of the king that shall reign over them. 21. “And the Lord said unto Samuel, ________________ unto their voice, and make them a ________________” (I Sam. 8:22).